You may know Michael Gingold as the former Editor-in-Chief of Fangoria, as well as his current status as east coast editor for Rue Morgue, and contributor to many fine books on the genre. 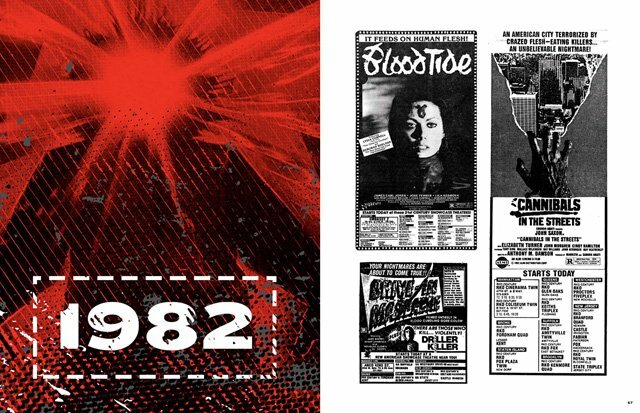 Before he was one of the foremost horror aficionados of our time, Gingold wrote and self-published the horror review fanzine Scareaphanalia, and throughout the 1980’s kept a shockingly thorough collection of newspaper clippings of horror ads. Those clippings now form the basis of his new book Ad Nauseam: Newsprint Nightmares from the 1980’s. It’s more than a mere coffee table book filled with retro horror movie ads from the go-go ’80s, as it also features clips from prominent reviews of these films from the time (many of which seem ridiculously off-track) as well as Gingold’s personal remembrances of seeing these films in the grindhouse palaces of The Big Apple. Check out our exclusive interview with Michael Gingold about Ad Nauseam below, and click here to get your hands on your own copy of the book! If you’re in the New York area you can come to Forbidden Planet NYC on September 20 from 6pm to 8pm to pick up a copy and meet Gingold himself for a signing! There will also be another signing event at the Brooklyn Horror Film Festival’s ’80s horror marathon on Friday, October 12. ComingSoon.net: My first question: Is the kid on the cover supposed to be you or Kim Jong-un? Michael Gingold: (Laughs) Well, I didn’t have glasses back then, nor did I have that kind of jacket, but otherwise it’s a fair approximation! Let me just add that I love that illustration by Andrew Wright, which really captures the spirit of the book. CS: First for real question: How did you store all these clipping for all these years, and how difficult was it for the book’s designers to de-yellow/remaster them? Gingold: I kept them in files separated by years, which made them easy to find if I needed to dip into them for reference. Every so often over the years, someone would ask me for a scan of one ad or another, but otherwise I kept them out of the light, so they hadn’t yellowed too much. You’d have to ask my publisher about the process of remastering them, but I know one challenge was finding a scanner big enough to handle the largest ads, like those spread across two broadsheet-size pages. He eventually found one at a museum that he was able to use. CS: Of all the movies showcased in the book, which one do you think had the biggest impact on you at the time? Gingold: Definitely “Halloween.” Even though it’s a 1978 film, it’s represented in the book by a 1980 rerelease ad, with a bunch of critics’ raves excerpted on it. “Halloween” was the first movie that scared the hell out of me and made me love it. I saw it during its ’79 reissue, right at the time I first started collecting the ads. 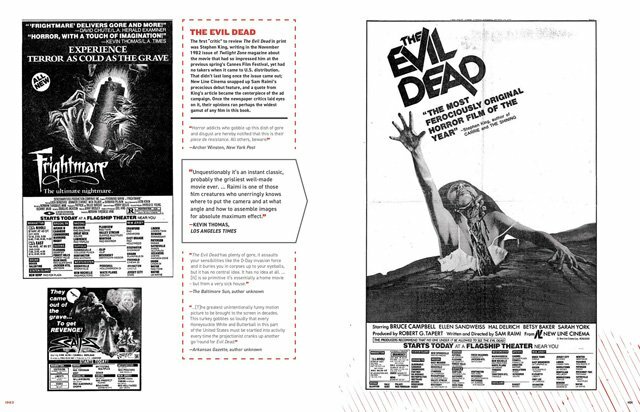 It made me a horror fan, which inspired me to cut out every ad I could find from then on. CS: A lot of these movies showed at, let’s say, less reputable theaters. Did you have any weird experiences going to any of these films in the 80’s? Gingold: Oh, sure! Even in suburbia, there were theaters that were as rundown and gross as the 42nd Street dives. One was the Colony theater in White Plains, NY. I remember seeing “Swamp Thing” there with a couple of friends and their mom, and the carpets on the aisles were sticky from spilled soda and God knows what else. At one point, their mom got up to use the rest room, and as the characters on screen were squishing their way through the swamp, she was squishing her way up the aisle! I caught meningitis when I was 16, and I had been to the Colony a week or so before, and I’m convinced I got it there. In my later high-school years, I started going to the actual 42nd Street and Times Square grindhouses, and my most memorable experience wasn’t during a horror film, but at a theater showing a triple bill of kung fu movies. A friend and I went on a Saturday, and we were there when they raised the gate for the first show at noon. We walked in, and it was pitch black in there, so we were kind of feeling our way down the aisle. Then I went to sit in one of the seats, and there was already someone sitting in it! There were a few people who had spent the night sleeping in the theater. I think we made it through about one and a half movies before we decided to get the hell out of there. CS: What did your parents think of your interest in horror? Were they supportive? Gingold: I guess you could say they tolerated it. I started my Xerox fanzine Scareaphanalia when I had just turned 16, and I think they appreciated that I was doing something productive with my interest. My grandparents actually took me to see horror movies before I was old enough to go myself—which, by the way, was when I was 14, and discovered some theaters would let kids under 17 into R-rated movies without parents. CS: The book spans the entire 1980’s. What would you say was the major sea change in the genre from the beginning of the decade to the end? Gingold: By the end of the ’80s, horror was in decline. The popular franchises were burning out, a lot of the independent distributors were folding because of competition from video, and the genre in general had a bad reputation—that was the period when a lot of filmmakers were saying their films were “not horror movies.” It wasn’t until the late ’90s that it really started to recover. CS: Were there any specific pleasant/unpleasant/interesting memories going through these clippings brought back? Gingold: The main one was just remembering the excitement of living through a time when you would open up a newspaper every Friday, not knowing what strange or cool-looking new movie was going to be advertised there. Looking at some of the ads, especially for the really small, obscure films that only played a few theaters, I could recall being so curious about these movies that I didn’t know if I’d ever get to see. Those ads really did their job! CS: It’s fascinating to see so many renowned critics writing such prudish reviews of films that are now considered classics. Of all the reviews in the book, which do you think got it the most wrong? Gingold: Well, Roger Ebert could be fair to horror movies sometimes, but he was way off base with “The Hitcher.” That movie got quite a few positive reviews, but Ebert—as well as Gene Siskel—completely trashed it, and Ebert’s pan was partially based on a misreading of the movie. He started his review by saying that the film opens with the hitcher striking a match, and ends with C. Thomas Howell’s character striking one, suggesting a bond between the two—but in fact it’s Howell who strikes the match at the beginning as well as the end. CS: Keeping that in mind, do you think there’s any horror film from the most recent decade that will, years from now, be heralded as a classic unappreciated in its time? Gingold: “Life After Beth” is a movie some people didn’t like that I loved. It has a great balance of horror, humor and emotion, and is odd enough that I hope it achieves the cult status it richly deserves someday. Same thing for “Grabbers,” which is a very clever monster movie with a really fun hook. Everyone I know who’s seen it really digs it, but I feel like a lot more people need to see it. CS: Which of the films in this book did you love at the time that you now loathe? Vice versa, which did you hate at the time but have grown to appreciate? Gingold: I wouldn’t say loathe, but “Galaxy of Terror” didn’t hold up at all when I saw it recently for the first time in many years. When I saw it as a teenager, the shock scenes made quite an impression, but when I saw it again—boy, it’s a mess in terms of storytelling. None of the scenes seem to connect to each other. On the other hand, I thought “The Keep” was really boring and pretentious when it first came out, but then I caught it a couple of years ago and appreciated it much more. It still has problems, but also a lot of really interesting things going for it, and it actually plays better as a WWII drama than a horror film. And I certainly liked Zulawski’s “Possession” a lot more when I saw the uncut version than I did when I caught the hacked-up version that played theaters in 1983! CS: You devote the epilogue of this book to the infamous Aquarius Releasing. Do you have a favorite film that Aquarius distributed? A favorite campaign? Gingold: I guess my favorite movie they handled was “7 Doors of Death,” though again, I prefer it in its uncut form as “The Beyond.” And I loved it when they put the little rhymes on their ads, like one for “Driller Killer” from 1979 that I wish I had in the book, which says, “Several pints of blood will spill/When teenage girls confront his drill”—even though there are, of course, no teenage girl victims in it. They had another one for a kung fu movie called “Devil’s Three” that reads, “Karate babes will look and laugh/While killer thugs are chopped in half”! CS: You highlight a lot of the major releases from the 80’s, but also some very obscure films. 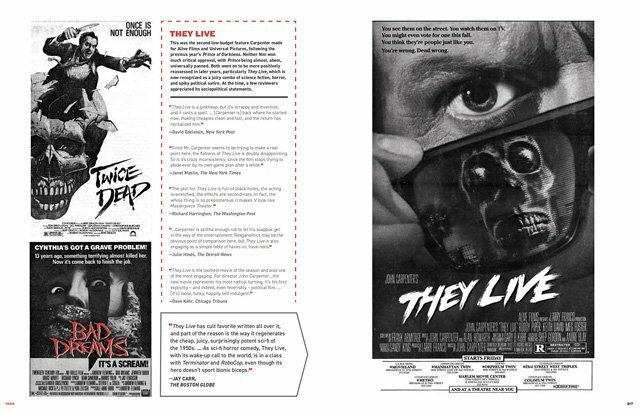 Of the lesser-known horror films of the 80’s featured in this book, which do you recommend to viewers the most? It doesn’t have to be the BEST, necessarily, maybe the weirdest/most interesting? Gingold: That’s kind of a tough question, since very few of these movies are truly obscure these days. Most of the good little horror movies from the ’80s—and quite a few bad ones!—have been celebrated somewhere or other, or revived on Blu-ray. One film that’s a lot more obscure than it should be is Bernard Rose’s “Paperhouse.” That’s a terrific movie that got some good attention at the time it came out, but today I think a lot of people just know it as the horror film Rose made before “Candyman.” It’s on VOD, but it’s never been on disc in the U.S. and deserves a proper Blu-ray edition. CS: We now live in an era where you can find almost ANY movie on DVD, Blu-ray or digital. That wasn’t always the case, though. What was the hardest you ever had to work to track down or see a movie? Gingold: I used to trade Scareaphanalia with a guy in Australia named David Nolte, who put out a ‘zine called Crimson Celluloid. He told me a lot about “Razorback” when it opened down there, and it was a big deal in that country and I got really excited for it. But Warner Bros. completely dumped it in the U.S. and never gave it an official release in New York. It finally played there a year later for one weekend at the late, lamented Thalia theater, a little specialty/revival house on the Upper West Side, and I managed to catch it there and thought it was one of the most beautifully shot horror movies I’d ever seen. It has also never been given a proper U.S. disc release, but a great all-region Blu-ray just came out in Australia. CS: If you could appoint only one filmmaker as the true horror hero of the 1980’s, who would you crown and why? Gingold: It would have to be John Carpenter. Not only did he make the film that set me on this path, but it was exciting to be a fan of his during the ’80s because he had a new film out practically every year. And each one was different—”The Fog” was different from “Halloween,” “Escape From New York” was different from “The Fog,” “The Thing” was different from “Escape” and so on. Movies of his like “The Thing” and “Big Trouble in Little China” were ahead of their time and not appreciated by many people back then, but I loved them when I first saw them and still do. CS: Since leaving Fangoria you’ve seen your profile rise immensely doing stuff for Rue Morgue, for different festivals, Blu-ray features and penning several books. Are you pleased to see a new generation discovering your writing? Gingold: I’ve really appreciated all the opportunities I’ve had since I got let go from Fango, and it’s been a lot of fun working on such a diverse amount of projects—including writing about movies outside the genre. The horror audience has grown so much since I first started at Fango, and I’m very pleased to have so many ways to connect with them. “Ad Nauseam” in particular is a perfect way to share my love for horror growing up in the ’80s with younger fans who weren’t around back then. I have to say, it’s also humbling when people tell me they grew up reading my work. CS: What makes you the most excited to be a part of the new Fangoria relaunch? Gingold: Just the fact that it’s backed by people who know what they’re doing, and who appreciate both the genre and the magazine’s writers. It was such a happy surprise to get the call that Fango was coming back in print, from people who had a real commitment to make it something special, and I think everyone’s going to love what we’ve come up with for the first issue! The post CS Interview: Michael Gingold on His Horror Movie Book Ad Nauseam appeared first on ComingSoon.net.